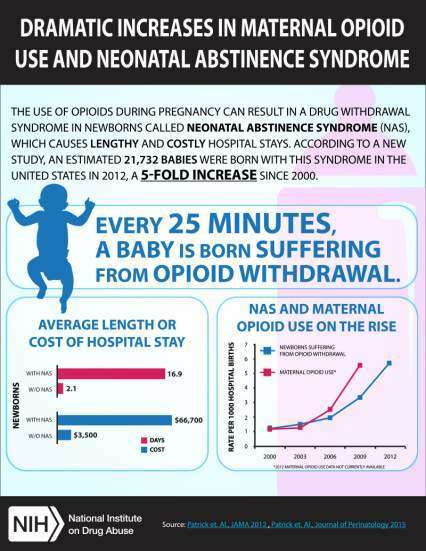 Neonatal abstinence syndrome (NAS) can occur in babies who have been exposed to opioids, alcohol or other addictive substances while in the womb. NAS usually appears within 48–72 hours of birth, when the babies begin to suffer withdrawal. Common symptoms include low birth weight, tremors, high-pitched, continuous crying, feeding difficulties, vomiting and fever. Opioid exposure during pregnancy might result from a mother's physician-approved use of prescription opioids for pain relief, from misuse of prescription opioids, from illicit opioid use (e.g.,heroin), or medication-assisted treatment of opioid use disorder. Treatment options for NAS depend on factors that include the baby's gestational age, overall health, the type of substance and the extent of the baby's dependence. Placing babies in a dark, quiet nursery space, careful swaddling, and other measures to minimize environmental stimuli can help comfort them. Some babies may need extra calories or intravenous fluids. Babies in withdrawal from severe opioid dependency may be placed on a tapered regimen of opioid-based medication to ease their withdrawal. Use of opiates during pregnancy can result in a drug withdrawal syndrome in newborns called neonatal abstinence syndrome (NAS). A new study to determine the extent, context, and costs of NAS found that incidence of NAS is rising in the United States. There was a five-fold increase in the proportion of babies born with NAS from 2000 to 2012, when an estimated 21,732 infants were born with NAS —equivalent to one baby suffering from opiate withdrawal born every 25 minutes. Newborns with NAS were more likely than other babies to also have low birthweight and respiratory complications. The number of delivering mothers using or dependent on opiates rose nearly five-fold from 2000 to 2009, to an estimated 23,009. In 2012, newborns with NAS stayed in the hospital an average of 16.9 days (compared to 2.1. days for other newborns), costing hospitals an estimated $1.5 billion; the majority of these charges (81%) were paid by state Medicaid programs, reflecting the greater tendency of opiate-abusing mothers to be from lower-income communities. The rising frequency (and costs) of drug withdrawal in newborns points to the need for measures to reduce antenatal exposure to opiates.